Rebecca has husband and kid and is the perfect houswife, but she wants some excitement and is on the lookout for a nice escapade. And - look at that - there's Dirk whom she really likes. Bille is actually really doing the sailing training in order to learn how to sail, but only to make her boyfriend jelous, who always brags about his oh-so-endless knowledge about sailing but doesn't have a certificate for it. At the end of the training course, the participants and Stefan go on a two-week sailing trip during which, while divided in two boats, they can enjoy the sport and (more or less) perfectionate their skills. Due to the fact that Judith shares a boat with Stefan (and others), it could be so perfect but she ain't the only one with an interest in him: Angela, another attendant of the training, who is Stefan's new girlfriend. And she even has a boyfriend herself! Plus, how could she stop Stefan smuggling goodies? And how will the cruise end up for Bille and Rebecca? This book is some good summer reading: it has an attractive plot, but doesn't go too deep, so it's perfect for beach and pool (which I even tested out :D). 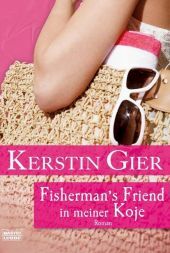 Kerstin Gier writes with witty comments in first person and even writes down the thoughts I'd have myself if I were in Judith's place, even if they weren't really thematically relevant (a/k/a just the funny, unimportant crap ^^). I had some good laughs with this book and other pool visitors even looked at me as if I were a loonatic. You'd hardly believe it, but this book has even some literarily quality - you'd learn plenty of stuff. If you pay attention, you can learn how to produce some knots and get to know parts of the ship, like the scuppers, which are the pipes in the walls of the deck that allow the water (if it's been raining on etc.) to drain off. To sum it all up, the book was good, even though adressed to women between the ages of 25 and 30, it is suitable for all the other women out there. Of course I'd recommend it to anybody asking for an easy reading, but it's more suitible for summer than for winter.